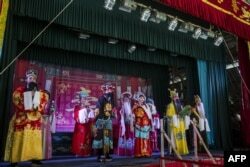 Cantonese opera actors perform inside a bamboo theater in Kowloon District, Hong Kong Friday, Jan. 20, 2012. Hong Kong’s Sunbeam Theatre will stage a performance of Trump On Show, a three and a half hour comedic reimagining of the U.S. president’s life and that of his fictional twin brother who lives in China. The opera was written, directed and produced by Edward Li Kui-ming, a Feng shui master and film producer turned prolific playwright. Such a light-hearted and humorous look at Chinese history is almost unthinkable in mainland China today, which resumed sovereignty of the former British colony in 1997. Hong Kong has more freedoms than China until 2047 under the "one country, two systems" model, although many residents and political leaders fear where the city will head when that period expires. Chiu Chow Opera performers sing on stage as part of the Hungry Ghost Festival in Hong Kong on September 4, 2018.